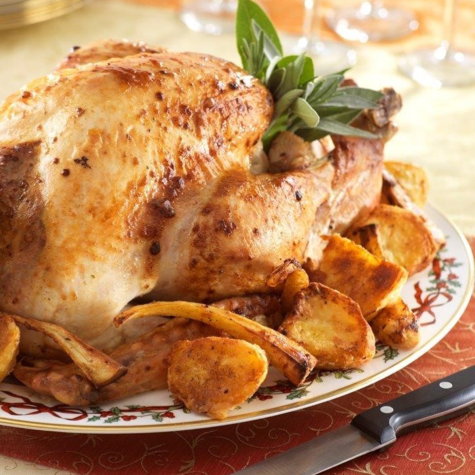 A Colman’s Roast Turkey for the whole family to enjoy this Christmas. What does your roast say? Preheat the oven to 220°C, 425°F fan oven, Gas Mark 7. Carefully loosen the skin over the turkey breasts. Mix together all the ingredients for the baste and spread under the skin over the breast. Place the turkey in a large roasting dish and cover with foil. Cook in the preheated oven (220°C, 425°F, Gas 7) for 40 minutes then reduce the heat to 170°C, 325°F, Gas 3 and cook for a further 3-3½ hours. Remove the foil, baste well, and increase the oven temperature to 200°C, 400°F, Gas 6 and cook for a further 30-45 minutes until well browned and thoroughly cooked through. Transfer to a large serving plate, cover loosely with foil and leave to stand for up to 45 minutes (to relax the meat and make carving easier).